Ewok, a 12 year old feisty long haired indoor black and white cat, was visited this January by a bat that flew into her apartment. Agile Ewok sprang into action, and caught the bat in her mouth. Her owner was bitten in the process of removing the bat from the cat. Bats are the most prevalent carriers of rabies in the province, accounting for 27 of the 28 rabies cases in Ontario in 2013. If a person has been bitten or scratched by a bat, wash the wound with soap and water for 15 minutes then visit your physician who will notify the public health department. 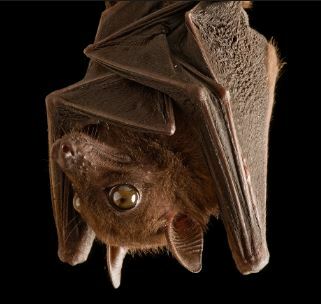 If a pet has come into contact with a bat, wash any wounds with soap and water for 15 minutes, contact your veterinarian and report the incident to the public health department. An inspector will visit the premises, take the bat for testing, and set up a quarantine for the pet. Quarantines can range from 10 to 180 days depending on the type of exposure and vaccination history. Ewok’s owner began post exposure rabies vaccination. Awaiting test results was extremely stressful – the owners were worried for the well being of their beloved cat and for themselves. Luckily the bat tested negative for Rabies. Ewok was released from quarantine and came to the Bracebridge Animal Hospital for a complete physical exam and vaccination. Please call to schedule an appointment to bring all your indoor and outdoor pets in for this life saving and government mandated vaccine.